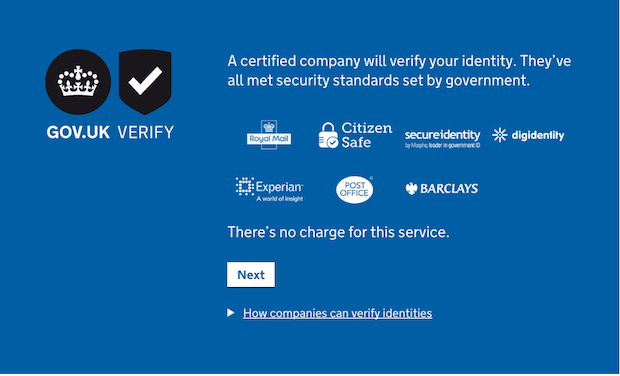 GOV.UK Verify is a federated model where the government sets the standards for identity assurance. Our certified companies are responsible for developing and delivering services that meet those standards. They are working in a competitive environment and are responsible for maintaining their own services. Our role at GDS is to support them, make sure they’re compliant with our standards and are using the best technology possible. What remains constant across GOV.UK Verify is the importance of starting with user needs. All parts of the federation must respond to the same user needs in the context of a complex user journey that is unfamiliar to the user. Having completed our 100th round of user research on Verify back in August, we understand the importance of sharing what we have learned with certified companies from our research with users. Over time we have done this in a variety of ways, including providing feedback to certified companies following our own usability testing of their services as part of a rigorous onboarding process. We’ve also shared our findings from contextual accessibility research with them. Additionally, we conduct workshops with certified companies. In our 2 most recent workshops, we presented and explored core user needs and design principles, as well as shared some new ideas that we are planning to test and iterate over coming months. This blog post provides an insight into what was covered. During the first workshop, we decided it was important to bring all certified companies to the same place in their understanding of GOV.UK Verify’s user needs and design principles. We introduced the idea of there being expressed, tacit and created user needs, developed by Pete Gale. We then discussed how these informed design principles such as ‘enable the user to complete the task’. This derives from the expressed user need of, for example, ‘I need to view my driving licence so I can provide a check code to my insurer’. In practical terms, this can be seen in our focus on improving completion rate. We also ensure that if we’re unable to verify a user’s identity, we inform them of an alternative way to, for example, view their driving licence, as quickly as possible. We were really pleased to hear how valuable attendees from certified companies found the session. They told us it helped them to understand why GOV.UK Verify has evolved in a certain way. They also said they felt better able to answer questions from colleagues and stakeholders about the design of the GOV.UK Verify journey. The second workshop was more interactive. Our designer Michael Thomas walked attendees through our early ideas for a way we might redesign the GOV.UK Verify hub to make it more flexible, sustainable, and able to offer a better way to help users find the certified companies that are most likely to be able to verify them. The certified companies were then asked to critique, feedback and suggest research questions for us to take into account as we develop this idea through iterative testing. This sparked extremely deep and detailed discussion, which really helped us to better understand the certified companies’ priorities and perspective on the user journey. It also gave us some really interesting and useful things to think about in future testing. Despite being in a competitive environment, the workshops demonstrated that our certified companies are clearly dedicated to innovating and improving users’ access to digital services. Bringing the certified companies together to learn as a group with support from GDS was a success. The workshops made it easier to share knowledge and discover new opportunities that would be a benefit to all members of the federation, and our users. We’re already planning more workshops for the coming months and are looking forward to working at this level with our certified companies again. Subscribe to the blog to continue learning about how we’re working with certified companies to improve GOV.UK Verify.